In recent years, Director Simon West has become known for turning simple action movies into big hits, thanks his unique story lines. The story doesn't actually mean as much in action films as it does in other genres, because as long as people are getting killed and things are blowing up, most action fans are satisfied. Simon West wasn't and in recent years, he has given us some great stories to go along with the amazing action. His most recent film is actually a remake of the 1972 Charles Bronson classic, by the same name. The Mechanic is a code name for CIA hit-man, Arthur Bishop (Jason Statham). For years, the Mechanic has gotten the job done without question, until one day his next target is revealed as his mentor. The stories are similar, but the special effects and action moves are much more intense, and we have Jason Statham to thank for that. This man has single handedly taken action films to another level. For those unfamiliar, the man speaks several different languages, is trained in dozens of forms of fighting, and he's quick with a joke, many of which are unscripted. Every film Statham does is entertaining for his tremendous moves and unpredictability. The Mechanic gives Statham the chance to show off his talents and for that, I loved it, but trying to modernize the original story without changing it all that much, makes things feel a little outdated. I found many things to be tame by today's standards and the film itself does suffer because of it. Statham is paired with Ben Foster and that's problematic for the film as well. Foster is not known as an action star, he's the complete opposite of Statham, and in this case opposites do not attract, they had no chemistry whatsoever. In my opinion, Jonathan Rhys-Myers or Alex Pettyfer would have been a much better choice, but I am just a reviewer. 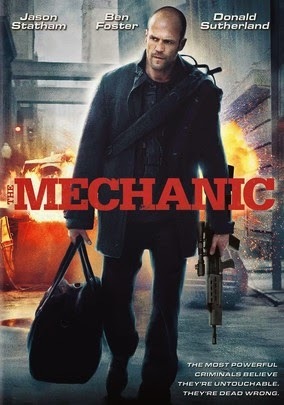 That being said, the Mechanic isn't a bad movie, it has all the moves and wit of a typical Statham movie, but the story is more than a little outdated and aside from Statham and Sutherland, the casting left a lot to be desired.